All natural alternative to the poisons that cause unwanted, sometimes disastrous results to our pets. 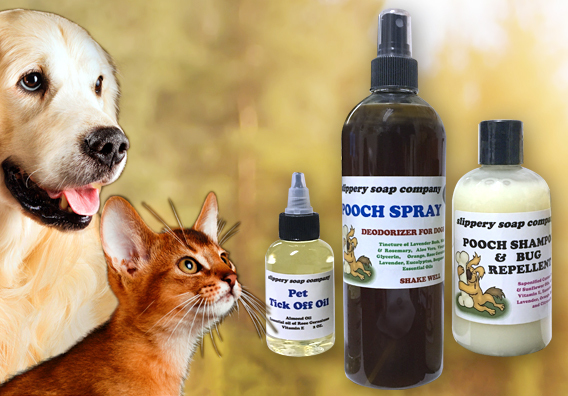 Repels tics and fleas on cats and dogs, and yourself. Can be sprayed on fur or bedding, glycerin makes it stick! Pleasant scent. Protect from cracked paws, ice, salt. Packaged in a convenient roll-on container. Scented with essential oils that repel tics and citronella to repel mosquitoes (heart worm), this a nicely lathering shampoo for your pooch. So concentrated, all that is needed for a little pup - the size of a dime. For Boy or Girl Dog? 18.5% Bickmore Pine Tar - Start at the head, nothing in the eyes, and work to the tail. KILLS FLEAS!